Lil' Blog and More: Week 39 of Nutrisystem! 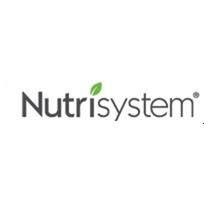 39th week of Nutrisystem - Woo hoo! I am so happy! No no.. I didn't meet my goal.. but, I am very very close! I continued that workout regiment that I found on Pinterest last week (It's slowly getting harder!) and I did some biking.. and more recently I had started playing with the kids outside. The kids are always coming over and asking if I want to play, and for a while, I was declining quite often. And then it hit me.. Kids are really active! So, all week I've been playing manhunt, tag, volleyball.. all sorts of stuff! So, I am happy to announce that this week, I am down 1.6lbs!! Bringing my total weight loss to -48.6lbs! I am so excited about next week, because if I can just stay strong this week, I know that by next week I can definitely be at my goal. I do like this dish for the most part. The Salisbury steak is really delicious (minus the mushrooms in the gravy) but the Mac N Cheese is a little lacking for me, but I'm not the biggest fan as it is. It's still very filling though, and isn't as bad as other mac n cheeses that I've had. I can't even describe how delicious this is!! 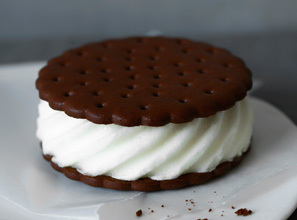 The ice cream sandwiches used to be the regular rectangular shape, but they changed it up a little, which is always fun. This tastes just like a delicious ice cream sandwich from the store! I would highly, highly recommend it! Awesome Job! Now I want an ice cream sandwich! ha ha!